Protect and preserve Ocean Reefs around the world with your purchase! Info about The Respect The Reef website and campaign. Aquarium of the Pacific is a wonderful place to experience and learn about aquatic life. 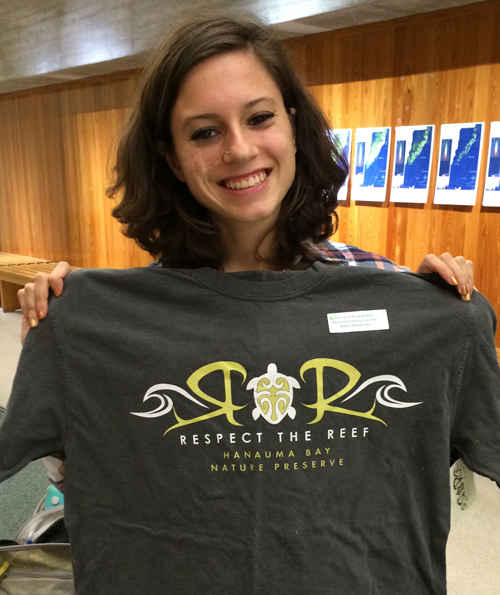 They have been great partners with Respect the Reef selling our merchandise in their shops. If you get the opportunity, stop by and help support their efforts. Here is a recent article in the New York Times about dredging in the Port of Miami. We feel it’s important to be aware of these activities and help prevent further destruction. Respect the Reef has just sent some of our books and clothes to the IMUA Family Center On Maui. This is a wonderful organization that has been doing extraordinary work for families for decades. The more I read about their efforts the more I became a fan. Respect the Reef is also about supporting communities that are effected by ocean ecology. Help support IMUA if you can. 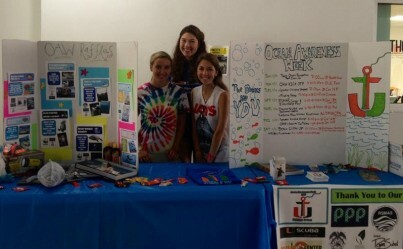 Respect the Reef loves Ocean Awareness Week! Respect the Reef was excited to donate products to help raise funds for University of Miami’s Ocean Awareness week—November 11 -November 16, 2013. Looks like there was a great turnout and everyone had fun learning about the importance of our oceans! Go University of Miami! Great job supporting reef education and awareness! Lots of people learned more about the importance of ocean ecology at Ocean Awareness Week Nov. 2013. Good Job University of Miami! 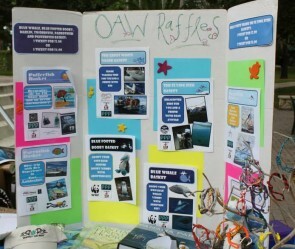 Display at the University of Miami’s Ocean Awareness Event, Nov. 2013. Excellent job teaching about ocean ecology! Way to go University of Miami students! Keep working to teach and inspire others to learn more about the oceans and reef ecology. Save the reefs! Small Fish Unite! Everyone can help save the reef! We talk a lot here at Respect the Reef about rescuing coral reefs, but sometimes it is easy to become overwhelmed and give up. Don’t despair! Small fish like us have lots of opportunities to help save the reef. Often, it doesn’t even take much time! The National Oceanic and Atmospheric Administration (NOAA) has posted a list of 25 things You Can Do to Save Coral Reefs. You don’t even have to live near a reef to help! Don’t use chemically enhanced pesticides and fertilizers. Although you may live thousands of miles from a coral reef ecosystem, these products end up in the watershed and may ultimately impact the waters that support coral. Become a member of your local aquarium or zoo. Ask what they are doing and what your donation can do toward saving the world’s coral reefs. The answer may pleasantly surprise you. Support conservation organizations. Many of them have coral reef programs, and your much-needed monetary support will make a big difference. Recycle. This is the first step each of us can take to make a change. Recycle anything and everything. If your community doesn’t have a program, do it anyway, and get one started. If you have time after working to save the reef, stop back and tell us what you are doing. Tell us about your successes or even your struggles. Your work could inspire someone else to step up and help. Lots of small fish like us can make a BIG difference! Let’s get working! The Colorado Ocean Coalition [Creating an Inland Ocean Movement] sponsors the Making Waves in Colorado Event. This event promises to be educational as well as entertaining. On top of all that, the even supports a great organization. Join us here in Colorado for Making Waves 2013! Join this weekend-long event to hear from cutting-edge researchers, world-renowned speakers, award-winning filmmakers and ocean advocates from across the country. We encourage you to get involved in the grassroots conversation that is calling for national action. Making Waves 2013 is brought to you by the Colorado Ocean Coalition and the Colorado Scuba Retailer’s Association. Go to the Colorado Ocean Coalition Website to reserve your spot for Making Waves 2013! The mission of the Colorado Ocean Coalition is to create, unite and empower a Colorado coalition with shared values, goals and actions to promote healthy oceans through education and community engagement. Until now, there has never been a unified voice for ocean protection in the Mountain States. The Colorado Ocean Coalition believes that you don’t have to be near the ocean to care about it. Our complex global economy and the interconnectedness of ecological systems mean that the actions we take in the mountains impact the health of the sea. These actions include eating seafood, using plastics, driving cars and sharing environmental ethics with our family and friends. We live on an ocean planet and the choices we make in the middle of the country have direct ties to the seas. 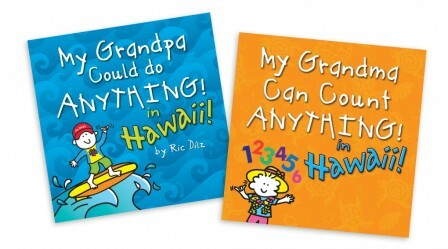 Ric Dilz started The Respect the Reef project to help create awareness about our oceans’ coral reefs. 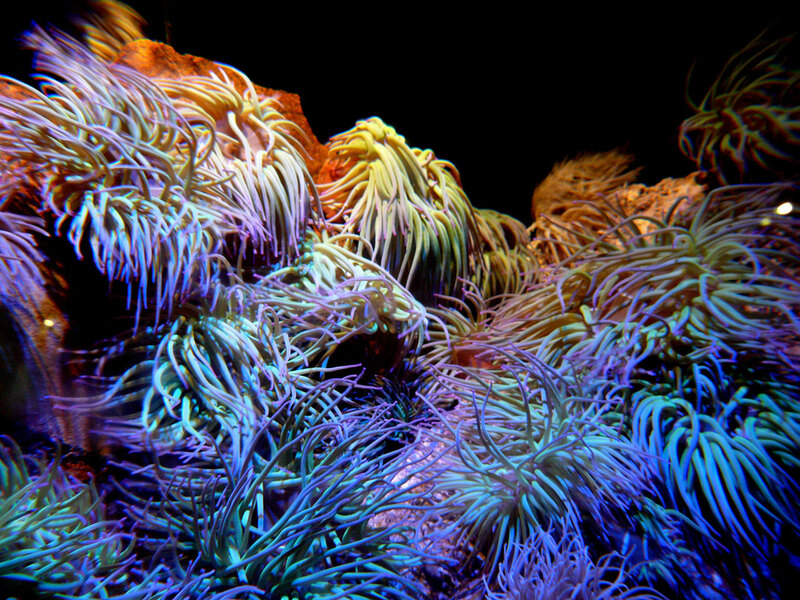 Ocean reefs are vital to the survival of many plant and animal life and impacts humans in many ways. Coral reefs affect Over 500 million people, directly and indirectly. It is critical that we start reversing damage done by human activity, or our reefs may never recover. The Respect the Reef project helps raise funds through product sales for reef research and education. We also encourage our visitors to donate directly to reef conservation organizations and to get involved in local preservation projects. 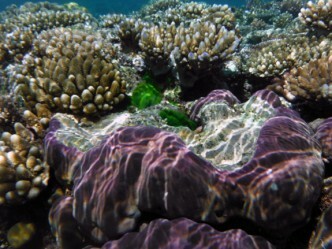 We select recipient organizations that support sustainability and of course reef preservation. We are at the beginning stages of our project and our web site will give more information on who we are donating to and how to donate directly to organizations that share our mission. We take our responsibility of being a good steward of the earth very seriously. Not only through environmental practices but through the many charities we support that help the less fortunate. Below is a letter from Bridget our recycling partner. We Love COCO’s Ambassador Program! Respect The Reef © 2019. All Rights Reserved.